If you’ve heard the word “mulligan,” you would immediately associate it with golf. However, this word has popped up in the most unlikely of all places – online poker. 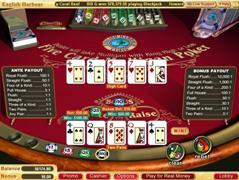 Thus, we introduce you to Mulligan Poker, a new and popular game that has caught the interest of online players. Where You Can Play Mulligan Poker? Currently, you can play Mulligan Poker at Liberty Slots Casino, our top rated casino for US players. As you may know by now, Liberty Slots Casino utilizes Wager Gaming Technology (which upon closer view may look very familiar to you). Wager Gaming Tech has replaced the ever popular Vegas Tech since it pulled out of the US market. And lucky for you it has! It is only through Wager Tech that you can enjoy this unique and lucrative poker game. Moreover, Liberty Slots is one of the best US casinos online, offering a wealth of promotions, tournaments, and more. At the outset, Mulligan Poker is played against the dealer. The best hand wins, or more precisely, if your hand is higher than the dealer’s hand, you win. The first thing you will do is to place your bet. Now there are two bets that you should place at the outset. A $1 bet is the Ante Bet; however, you may also want to place a Bonus bet as well. This is optional. Once the bet is placed, click on the Deal button. Five cards will be dealt to you, face up. The dealer will give himself 5 cards face down. You have two options: play the hand you are dealt or take a Mulligan. This means that you can discard all the cards. If you do, you will be required to raise an amount that is equal to your Ante bet. Note: If you chose to add the Bonus bet, you will lose it when you take a Mulligan. The dealer will give you 5 new cards. The dealer’s cards will be shown and if an Ace high or better, the dealer will stand. However, if the dealer has a King high or less, then the dealer will take a Mulligan. This is the point at which both the dealer’s hand and your hand will be compared to see who has the higher hand. If you do, then you win both the Ante bet and the Raise bet. If the dealer wins, you lose all bets. Before you play Mulligan Poker, we suggest you read the rules of the game, which are clearly delineated at Liberty Slots Casino. Moreover, you will be able to view the bet limits ($1 to $100), as well as the payouts for Ante, Raise, and Bonus bets. Just like in the game of golf, Mulligan Poker allows you to essentially “start over” if you don’t like the first set of cards you are dealt. This makes for an interesting and fun-filled game of poker.